This entry was posted in Beginner, Fitting, Muslins, New Look, Sewing, TNT's, Tops. Bookmark the permalink. Hi Elizabeth, Did the pattern say ‘loose-fitting’ ? The fit actually looks okay through the shoulders/neck. Pin the side seams in through your waist area, starting just under the armpit and then stand in front of the mirror and adjust the length to where it looks best on you. It’s not totally horrible. Play around with it, tweak it a bit and see if you can get a better fit. If not then don’t lose sleep over it, chuck the pattern and try another one. One thing I’ve learnt, through tears and trial, semi-fitted patterns add shape to your body (regardless of size) which loose-fitting garments do not do. I’m sure the top the model is wearing is not stitched straight out of the packet. It has a lot more shape through the waist than what the drawings have. Maybe it’s even pinned behind. Pin your side seams, give yourself some shape, maybe even pin some back darts in to shape through your back area. It’s a hard process to learning what looks good on our own personal body versus what looks good to our eyes on pattern envelopes. I like the blouse and the print is lovely. Sue is 100% right, tweaking the blouse by taking in the the side seams and shortening it will change your mind about it. I agree with the above commenters that this top should hopefully be salvageable with some alterations to the side seams. I also find that the sizing on patterns is a bit of a joke though – I’ve stopped using my measurements and their sizes as a guide but the finished garment measurements or measuring the pattern pieces to work that out and taking it from there. It is very frustrating though!! Develop a couple TNT patterns from basic key pieces and then use those for sizing. Have you read any of the blogs at http://www.sewingfantaticdiary.blogspot.com/ Carolyn (the blog owner) uses her main TNT dress pattern to make almost all her wardrobe. Search her site and you will see a wide variety of dresses – and most are adaptations of her main TNT pattern. And it took her numerous projects to get that TNT pattern to begin with, but once achieved then you can take off from there. Nothing will fit quite properly right from the envelope – but with experience you will find the initial work of fitting can pay off big on down the line. I would just take in the shirt at the sides and add darts as others have suggested and see what transpires. Shoulders and neck are the harder areas to fit – and this looks pretty good on you in those areas – at least in the picture. The sides and dart adjustments are easy-peasy. I agree with Sue. It’s really not that bad. It’s just to big around the waist. I’m right there with you in the quest for a TNT that fits. I started Kwik Sew 3740 over for the third time in an attempt to get it right. One of the things that really helps is to tissue fit the pattern and then the fabric with pins before you sew. Good luck. Have you tried looking at the patternreview site before (or even after purchasing) your patterns? Sometimes you’ll pick up on where you might run into problems you can remedy before you get too far into a project. Or maybe decide not to purchase or sew up based on the comments you read. I agree the top looks like you can make some adjustments so it will work for you. Uggggh. The Big 4 and their ilk are terrible about this. I made that New Look mock wrap dress that everybody loves and it came out so gigantic that it was laughable. I really don’t understand how they choose how much ease to put in. Thank you for your comment on my jacket/suit. This was the third time I attempted to interface an entire jacket. The first two were disasters. I’m learning that whether you do it or not depends on the fabric (although I’m sure some will disagree with me). I used a super light weight interfacing, the cheap pre-packaged type from Hancocks. If you’d like further info about my experiences, please email me at fayedoll@cox.net. Well, I hope you’re not going to start complaining that you’re too skinny to date now… :). Forgot to mention that the front facing was interfaced as well as the jacket front so I did not need to add extra for the buttonholes. The under collar was also interfaced. 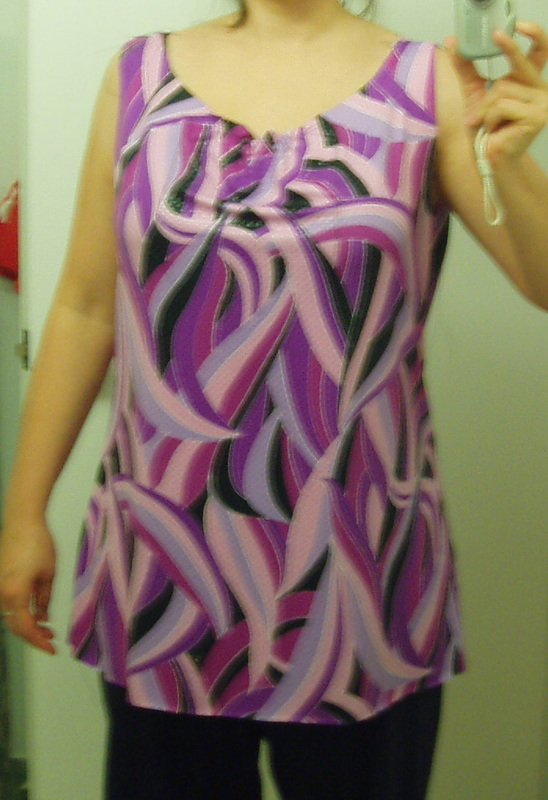 Yes, I made this one too, and a month later I unpicked the seams and cut it a size smaller! I made a point of mentioning that fact in my patternreview.com entry to save others from making the same mistake. I’ve definitely checked the finished measurements from then on.